A Full Moon Cycle = Another Nocturne! I love nocturnes! I think I will be producing a number of them this year. This one was inspired by our current full moon cycle but rather than paint last night's sky as seen over and through the trees I combined what I saw with what I know. I transported myself to the beach in front of our house on the Outer Banks of NC and painted this scene that I have experienced many times. It is breathtaking to be surrounded with such a sky combined with the sound and scent of the ocean. Today I was supposed to meet friends at 9:00 AM to paint at a local rose garden but I wasn't feeling well so I had to cancel. 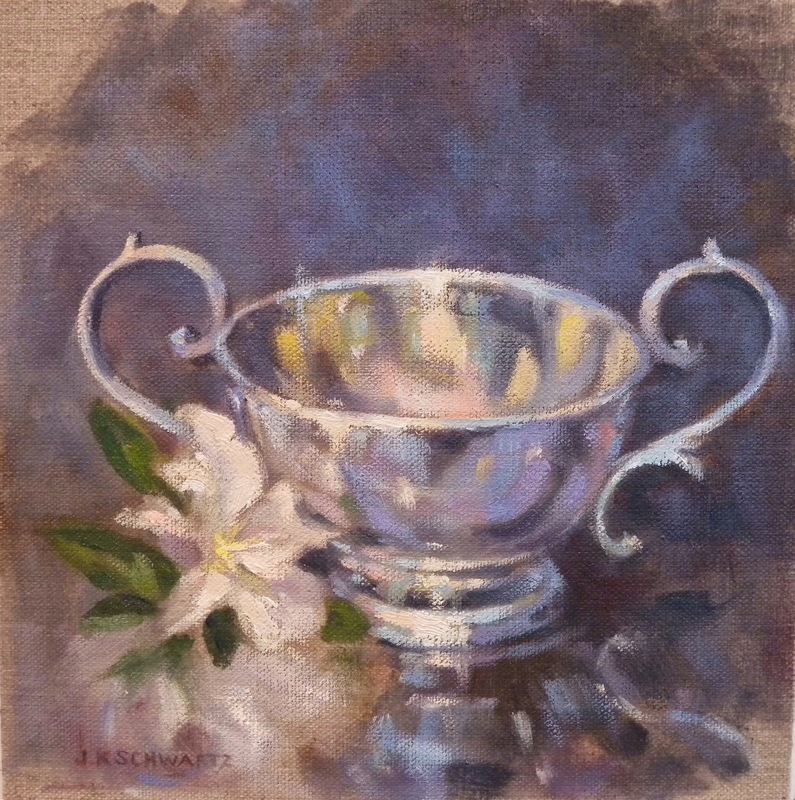 I am glad I felt well enough to work in the studio and paint this nocturne and then the little still life study below. There are some similarities in painting cloudy nocturnes and painting silver. It was fun and used up the paint remaining on my palette. ON EXHIBIT: This Saturday "Images of Washington" opens at American Painting Fine Art in DC. This is a Washington Society of Landscape Painters exhibit and runs from June 14th to September 27th. I will have four paintings in this show and all have been posted here. You can scroll back over the last couple of months to see them in progress. The paintings are "Cafe du Parc", "Lunch in Lafayette Square", "Cafe La Ruche" and "Kennedy Center Nocturne"